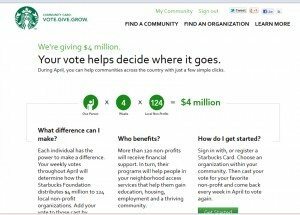 Starbucks card holders can log in to that site and vote for a non-profit organization. When you log in, it automatically defaults to your region. You can change your region if you want. 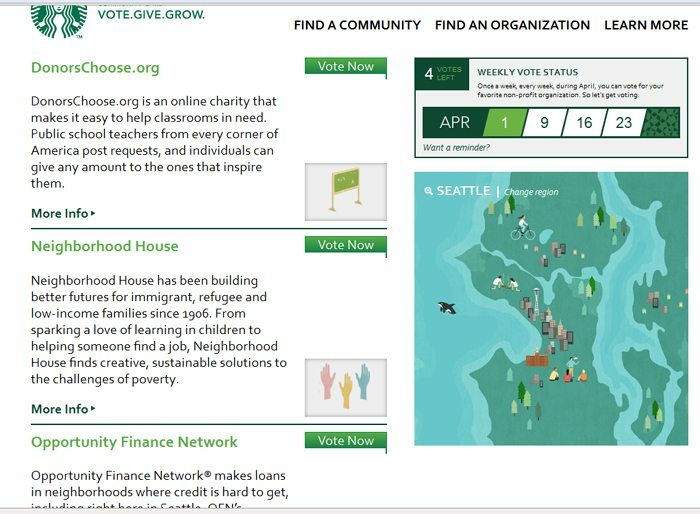 The examples below are for Seattle, but your region might have completely different non-profit candidates to vote on! 1) Donorschoose.org – A non-profit that through donations helps fund needy classrooms. I really do like this non-profit. They help schools that are poorly funded, and that struggle to provide an excellent education to children. 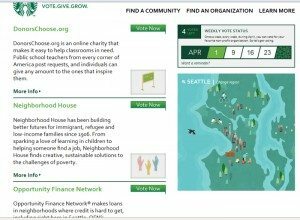 This non-profit is based out of New York City, and although I like supporting them, I wanted to vote on something local to Seattle. If you want to follow DonorsChoose on twitter, their profile is here. 2) Neighborhood House – This is a Seattle non-profit that offers a wide variety of services to at-risk groups. There are classes to help immigrants apply for citizenship; classes for at risk children in schools; resources to help elderly live independently; and much more. I voted for this organization because I wanted something local, well-established, and providing great resources to at risk Seattleites. If you want to follow the Neighborhood House on twitter, their profile is here. 3) Opportunity Finance Network – I don’t think I have to say much about this partnership because Starbucks has already heavily promoted this organization. I previously wrote about OFN last November in this blog article here. 4) Solid Ground – This is a non-profit in Seattle also designed to combat poverty. To be honest, it was the only one of the four that I was not already familiar with. I found it tough to make a decision! It looks like four very good choices! This week I voted for Neighborhood House, but maybe next week will be DonorsChoose. Hope you vote! You get one vote a week. I don’t usually post two articles in a day, but since this week is nearly over and there is still time to vote, I published this right away. In other news, Starbucks has announced that there soon will be a seasonal drink called the Mocha Cookie Crumble Frappuccino. And I think it is pretty cool that Banana Republic has joined Starbucks in supporting the Opportunity Finance Network. Banana Republic will have two shopping events where five percent of the sales gets donated to the OFN. It’s been quite a while since I’ve had an open thread, so here it is. Please feel free to talk about anything Starbucks-related! Starbucks collectibles: Reader submitted favorites - mugs, books, and a beautiful copper French press. Starbucks Community Service Goals: Less than half way to their annual goal? ‘Tis a Giving Season at Starbucks: #ExtraShotOfGood happening at Starbucks. This is really neat! And I didn’t even know about it! Nor did I know about the new MCCF! Yummy Summer drinks…. but I do miss coconut! Coconut is coming back so I hear! But that has not been officially announced. In Texas, our four options were Donors Choose, Gulf Cost Community Services Association, Jumpstart for Young Children, and Opportunity Finance. This week’s vote went to Jumpstart. Thanks for the info, Melody! DC & OFN also showed up in Portland. As much as I like DC, I chose a more local, less publicized one. I can’t wait to taste the MCCF! I understand why DC and OFN shows up – They’re large organizations partnered with Starbucks, and they do affect many local communities. I’d still rather see all 4 be truly local. Here in Seattle, Plymouth Housing Group, Team Child, and so many more non-profits all could easily be on the list of 4. Melody, I learned of this at Starbucks. They had hand-out cards at the counter with a sticker on them to place on your SB card as a reminder to vote. I have and will be voting for Brand New Day, an organization that is based in New Jersey. Trying to keep things local when I have the opportunity. This seems like a good way for SB to not only donate funds to a non-profit but to also raise awareness for the non-profits that are out there! Thanks for the heads-up, Melody! I had totally missed seeing this in my local store. I should look to see if there are stickers at my local SB. I do find it odd that they are not posting the community event they are doing on district wide and letting customers know about it. New drinks are always a good change-up at Starbucks. I saw coconut sprinkles at a Starbucks in Wisconsin last month. In recent years, the recipe has called for the sprinkles to be put on top but the original recipe had them blended in the beverage. When I am in the states at the end of the month I’ll have to login and see what I can vote for. Since this is not available here I don’t know the details of the program. I assume since customers are voting that the cause with the most votes gets the money? Do they do this regionally? 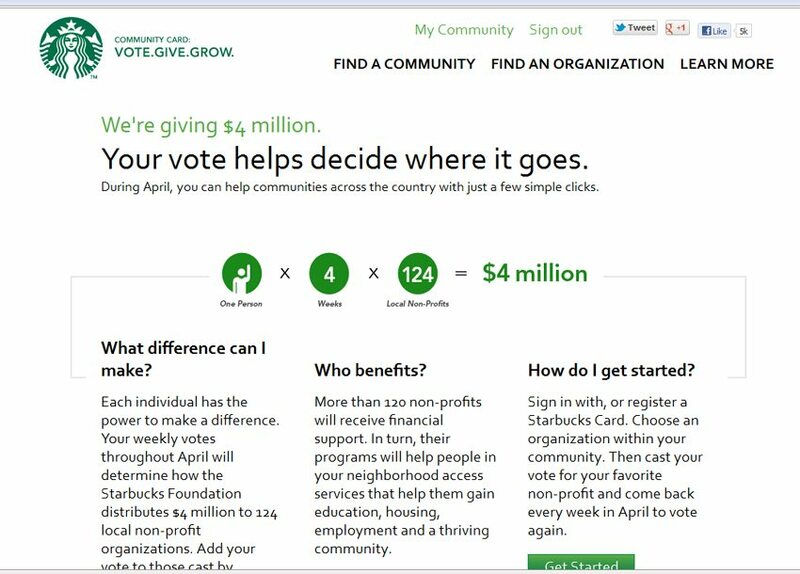 I guess since there are smaller, more local charities for people to vote for depending on where they live, there won’t be one big donation made? Sounds interesting. I’m going to go read about it now. The thing I am most excited about with the Mocha Cookie Crumble Frappuccino is the chocolate whipped cream! I voted for OSN. Just have to remember to come back weekly for the next vote. Love scanning my cell phone app at locations with drive thrus! Our local store doesn’t have a drive thru and I will never understand WHY Starbucks would buy a location WITHOUT drive thru access unless it is in a strip mall or shopping mall. EVERY stand alone location should have a drive thru for those busy days when a trip inside is inconvenient. @AmyInBoston – You can make a non-dairy Frappuccino with soy? I’m actually not a huge Frappuccino drinker. I don’t think I ever took advantage of the last Frappuccino Happy Hour. But I can see that it’s wildly popular. Just a quick note to anybody that wanted the Limited Edt. $39.99 White Gold Tumbler & didn’t get one before they were gone. I was just on the site and it’s shows as being available again. Ok maybe I am a bit jaded- got a survey today after not getting one for a bit and noticed that instead of getting a free drink which was the usual reward for completing the survey it now says a $1.00 off your next purchase. Really? That annoys me. Anyone else get the same reward for completing their survey? Boo to SB. I will gladly take $1 off a drink vs. a tall. I prefer a venti and that would be perfect for me! I guess I understand that $1 off is certainly before than just doing a survey without no reward but I find it interesting that they took away the free drink. On another note, I was chatting this am with the SM at my local SB and asked him about the I Vote stickers. I got one at another SB but apparently my local store was never sent any stickers. There are signs but no stickers. Sorry did not proof meant to say $1 off is certainly better than just doing a survey! One thing about getting a free “tall” beverage is that if you want an iced drink, “tall” rarely feels large enough. And with the old free tall beverages with the survey, it meant that you’d often end up with too small an iced drink or a hot drink. I can imagine in warmer clients this downright frustrated customers. And Americans want things bigger, bigger, bigger, bigger! I can imagine that for customer in places like Arizona or Texas who order a Trenta size, a tall beverage coupon just feels frustrating. Personally, I prefer the new flexibility of being able to get whatever I want. Now that there are free drink coupons via rewards, I feel like it’s easy to drown in free drinks. It’s fine by me to have something different. This could be its own thread topic! It is a good one! Melody I would love to see this as a separate blog post re the survey. As someone that has been getting the Trenta size more often especially before I go to the gym, I see what you are saying. However, as I have said I sort of feel it insulting that SB would take away the free tall drink reward for filling out the survey. I just wonder if it is because they are losing money on this reward or what? Also, overall it seems like they have cut back on some rewards anyway. Hi! Since we can talk about anything Starbucks related, I wanted to ask a question and I figured the Starbucks enthusiasts could help me or perhaps the admin can privately e-mail me if that would be better. I’m a student and unfortunately have to take pictures of people I don’t personally know for an environmental portraiture assignment. I say unfortunately, because I know people don’t really like random strangers taking their pictures and I feel invasive doing it. Anyways, I chose Starbucks as a good location, since it is lovely and has a lot going on always. I asked an employee if it was okay, and he said yes, but later on I got told “it’s against store policy.” So is photography ok, or not? On an entirely different note, I would *so* love to try out a coconut flavor, that must be awesome! @The Talking Pinhead – Welcome! I’m very curious, how did you find this site? This is an open thread, so we can talk about the Starbucks photo policy if you like. It actually is a complicated issue, with overlapping issues in it. 1. If you are a professional journalist, and you are going to use the photo in something like Seattle Times, Huffington Post, LA Times, whatever… technically, you should get approval from Starbucks PR department before taking photos. ^ But technically, big media needs to contact PR. If you are taking personal use photos – meaning you are not selling them, are somehow earning compensation from them, you should be able to take photos in a store. I think the partner that told you ‘it is against policy’ gave you bad information. You should probably contact Customer Service and let them know of your experience. I think (I am making this up! Guess work!) if you happen to stumble upon a store with a test, that those partners are told to be a little protective of their test items, however, technically the photo policy doesn’t actually change. Once a test is launched in the store with big signs that say, “Iced Peach Tea” it is pretty much out there for the world to see. You could run into some totally different issues if you are surreptitiously taking photos of people in the store. A. Hyopthetical situation – You run into Howard Schultz, President Obama, or Sarah Michelle Gellar in a store – Celebrities and “public figures” have fewer privacy rights than an ordinary person. Technically, you can just snap a photo of Howard when you run into him. I wouldn’t really do that if I were you – I would ask his permission, but I can assure you, you’ll irritate Howard if you just shove a camera at his face, and start snapping. B. Another hypothetical situation – You are taking photos of a gorgeous community table, and you incidentally get a couple of customers in the photo. An ordinary person does NOT have some ABSOLUTE privacy right in his or her own image, and if you’re out in public, you are subject to possibly accidentally and incidentally end up in photos. If you couldn’t, there would be a lot fewer Google map photos! C. Another hypothetical situation – You are in a store and you are trying to take photos of a customer (who is not a “public figure”) – Well that is much much trickier. Again, if you are out and about in public, you don’t really have some absolute right to privacy, but if you take such a photo, and you’re featuring an ordinary person for publication, technically you should get his or her permission. There is a fuzzy line between B and C – Actually, it is the reason that I over and over again comment that I try to do store articles when the store is nearly empty. Actually, the line between B and C is very fuzzy, and confuses the heck out of me!! I think your assignment would make me a little uncomfortable. But if you use an image of a person in a way that is improper, I’d think it would be up to that person to bring suit against you, not Starbucks. None of the above is legal advice. Consult with lawyer if you want legal advice. I’m not even totally sure of the answers above. I just know that the safest bet is to take photos of just beautiful espresso bars, and reclaimed wood detailing in stores, rather than people. I have an email that I carry in my purse from Sbux stating the ALLOWED policy of customers taking photos in their stores. As Melody said, in a much more elaborate way, the partner who told you it was not allowed was wrong. I recvd a nice Sbux card from corp. after my experience wirh a partner telling me wrong info re: the photo policy. It would make things much smoother if this huge corp. would make sure that all their stores knew corrrect policy….all policy. Denise so true about continuity re policy but as has been said before and Melody has also posted this is truly one of the weakest elements in training I think. I am amazed that SSC has not worked on developing a system so all partners know the same info. @purple1 and @DeniseR – The thing about the photo policy is a bit of a pet peeve of mine. About 2 weeks ago – It was the Saturday before Easter, whatever day that was – I walked into the Second and Lenora (or 2nd and Blanchard?) Starbucks at 6:55 am. That store was nearly empty. There was literally only one other customer in the store. The store has a nice seating area, and throughout the store there are very one-of-a-kind murals. Actually, before that day, I was unaware of what this store looked like inside because I really almost never go to it. Along one wall, in the lobby/seating area, is a great wall mural of a photograph – The 3 unique wall murals are all like black and white photos blown up to wall size. And it shows Seattle’s monorail still under construction, with the Seattle PI globe near the monorail (which is not where the PI Globe sits today in Seattle). I pulled out my phone and started taking photos of that mural. It was so interesting to me, and I love Seattle history. I took several photos, and kept backing up, because I kept noticing some glare in each one. A partner jumped out from the behind the counter, and was adjacent to me in a flash, and his very words were, “Ma’am I can’t have you taking photos in the store.” I nearly laughed. First off, that’s not Starbucks policy. Secondly, I’m facing an empty seating area and mural! That really annoys me. All I could think was “no” and what a controlling behavior statement. Number one, the policy IS that you can take pics in a store, and number two, I usually start snapping photos during those moments in between customers – which is going to change moment to moment. And in any case, at 7 am sharp on a Saturday, this store is dead. The partner really backed off, and suddenly was extremely friendly. At about 7:05, in walked Jim, We sat for a full hour in the store talking. He has so many Seattle memories because he really has lived here his WHOLE life! He remembers the monorail being constructed. I asked, ‘what’s the sign that says “Alweg” on the monorail?” and he said, it’s the company that made the cars. He could remember when the PI Globe got moved, and we talked about the adjacent mural of a “Westlake Chevrolet” dealership. He knew exactly the building. Apparently, if you have an origi 1950-1960s era license plate holder that says “Westlake Chevrolet” it is quite collectible. In any case, Jim would probably give his right arm to have one. @Melody and purple1 thanx to both of you for commenting on this. I clearly remember the day when a (previously) friendly partner called me over (I was taking pics of Christmas items, specifically the Huxley stuff!!!) so when she called me over and said I’m not allowed…bla bla bla….in front of, or with, 2 other really sweet partners who know me well and vice versa…..I actually stood there with tears forming in my eyes. BUT, I knew I wasn’t gonna let it go and I didn’t. Called Sbux corp IMMEDIATELY, emailed them and called Melody. and was soon responded to. thankfully. My sm said he wished I would always talk to him first (of course) but the partner had already told me that she was told to “tell me” by the shift so, it’s been my experience that when the partners don’t know, neither does the sm. and that is bad communication. funny that recently happened to you Melody. not funny but I would’ve liked to be there!!! 🙂 Plus, the fact that the partners turned all nicey-nicey once they REALIZED, kind of sickens me! Thank God WE know what we’re doing!!!! Obviously around here finding a Starbucks open is quite difficult and I totally understand it. My local SB has been closed since the storm started and have no idea when it will open. The SB stores that are open are jammed with folks charging their phones, etc. I went to the store locator and saw that they said my local SB was open. I really feel it would be a nice service for corporate SB to update the website and let people know which stores are open and those that are closed due to the storm.